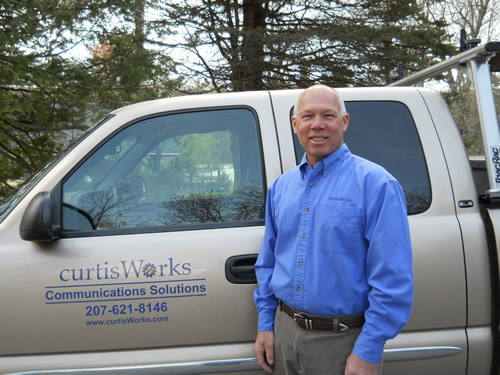 CurtisWorks Communications Solutions is a Maine-based technical and engineering services company. 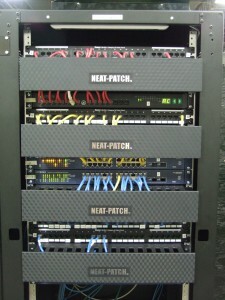 We specialize in installing and maintaining data, voice, audio, video and specialty communications cabling and equipment. Based in Augusta, we’re ready to serve your small business or residence. You can count on us for professional-grade installations, done right. We can also assist with your outside plant projects involving fiber optic and copper cables, underground conduit, pole lines and structure space licensing. Let us put our broad experience to work for you. We want to make every phase of your project a success…from planning and design through construction and ongoing maintenance. We can provide, install and service just about any type of communications equipment and cabling your business needs…just ask if it’s not included here! What’s more, you can count on a professional installation; workable, robust, neat, labeled, and easy to maintain…and we clean up when the job’s done. Most business owners or managers check out the aesthetic look and feel of a building, as well as the physical square footage when choosing where to office in an effort to find the best space for their workers and company. All too often they overlook acoustics and speech privacy, never realizing what a high cost an overly noisy office demands or the lack of confidential privacy office-wide. Speech privacy may seem like an unattainable ideal, or at the very least an unrealistic one. However, that’s a common misunderstanding- speech privacy is a measurable, quantifiable number on the privacy index. The speech privacy index serves as a means of measuring how intelligible speech is in a given area. If it’s quite intelligible, meaning people in surrounding areas can easily understand it, then that area has a low privacy index score. If your office has a low privacy index score, then it’s important to understand that there are only three ways to improve it: absorb, block, or cover the noise. These three techniques are commonly referred to as the ABC’s of sound masking. Absorbing and blocking techniques usually involve altering the existing building with not a a huge return of investment. In contrast, covering noise is highly effective and works with the existing structure without alteration. VoiceArrest Sound Masking SystemCovering solutions are based on the idea of masking sound so that it is not distracting or leaked unnecessarily. Interestingly, it is not a new technology. In fact, even the Romans intentionally placed fountains nearby their villas to drown out the ambient street noise. Since then, sound masking technology has only developed more, including the Department of Defense who has been developing it since the 1960s. The VoiceArrest system combines the latest innovations in speaker technology with a highly-targeted frequency spectrum to provide the most effective sound masking technology to date. Learn more about the VoiceArrest White Noise System, or contact us to find out what the VoiceArrest Sound Masking System can do for your facility! Dennis Curtis, owner of curtisWorks, began his communications career in 1978 as an Outside Plant Engineer at New England Telephone, now Verizon. His experience there encompassed the entire spectrum of Outside Plant projects…from copper cable to fiber optics, pole lines to underground conduit, electronics systems to survivable fiber rings, T-1s to DSL, highway reconstruction to railroad borings. Some outside plant projects today require structure space licensing to attach to pole lines or occupy underground conduit owned by the incumbent utilities. Dennis served as Verizon’s Maine License Administrator for several years, working to license pole and conduit space for hundreds of communications projects across Maine. This assignment also included overseeing reimbursable projects…both for damage and custom rearrangement of company plant. Dennis has also been active with special projects that extend beyond traditional engineering assignments. While at Verizon, he was involved in managing and implementing several technical projects to move engineers from manual methods to computer-based technologies. As a consultant, his projects include database maintenance, broadband installation and computer and networking services. Hands-on opportunities occurred during several labor strikes that required management personnel to fill union roles. Dennis took every advantage of these opportunities to learn the nuts-and-bolts of the industry, from line construction and cable splicing to voice and data installation and equipment configuration. These varied experiences positioned Dennis well to understand and build what his client needs. He continually draws on these resources to plan, design, coordinate and construct their communications projects. Contact curtisWorks now to help you succeed with your project! ©2018 CurtisWorks. All rights reserved.